With the refinance market continuing to dry up, finding ways to retain customers at risk of falling out of your mortgage portfolio is crucial to finishing 2018 strong. We’ve talked at length about Mortech’s customer retention tool that can help you do that; Mortech Protection, which uses Zillow web and mobile data to identify houses in your portfolio that are likely to go on the market soon. But there’s a big reason to start using Mortech Protection that we haven’t yet focused on: the amount of money you’re spending. Let’s say you have 100,000 loans in your mortgage portfolio. Marketing to all of those customers would cost a hefty chunk of change. If you sent a five-dollar mailer to each house, you just spent $500,000 dollars. Want to follow up with each one over the phone? That’s 200,000 minutes at just two minutes per call – over 3,000 hours of phone time that could be better spent looking for new customers. That’s where Mortech Protection comes in. By uploading your list of addresses for Mortech to monitor, we can return you only the 2,200 homes (again, out of a portfolio of 100,000 properties) that are likely to list in the next 90 days. You could spend twice as much marketing budget on those properties, and still only be spending $22,000 on mailers, or be on the phone for only 73 hours. Better still, these customers have been identified of having a high chance of listing soon. That means each call you’re making and piece of marketing material you’re sending out has a higher chance of succeeding, simply because these borrowers have a higher likelihood of needing a new loan. 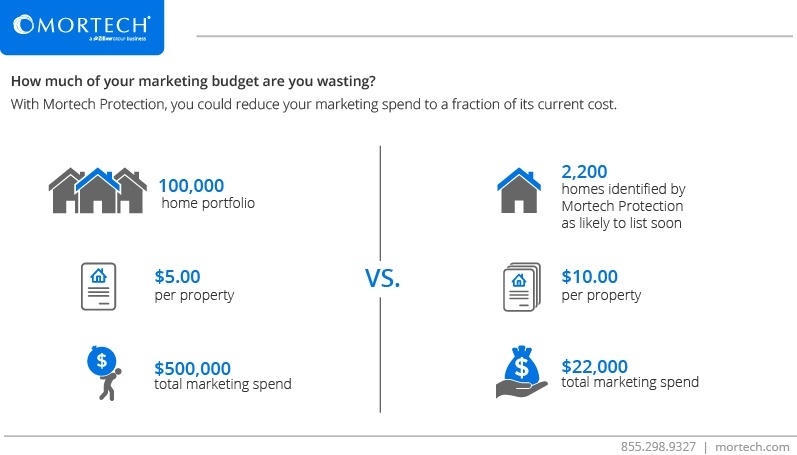 Call today and find out how much of your marketing budget you’re throwing away for nothing, and how Mortech Protection can help you spend less of your budget in a much smarter way. You can’t afford to wait.